For other treaties of Paris, see Treaty of Paris (disambiguation). Peace negotiations began in Paris in April 1782 and continued through the summer. 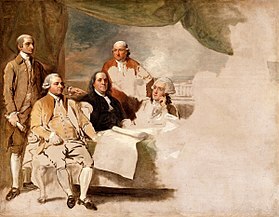 Representing the United States were Benjamin Franklin, John Jay, Henry Laurens, and John Adams. David Hartley and Richard Oswald represented Great Britain. 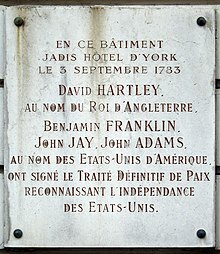 The treaty was drafted on November 30, 1782,[a] and signed at the Hotel d'York (at present 56 Rue Jacob) in Paris on September 3, 1783, by Adams, Franklin, Jay, and Hartley. Regarding the American Treaty, the key episodes came in September 1782, when French Foreign Minister Vergennes proposed a solution that was strongly opposed by his ally, the United States. France was exhausted by the war, and everyone wanted peace except for Spain, which insisted on continuing the war until it could capture Gibraltar from the British. Vergennes came up with the deal that Spain would accept instead of Gibraltar. The United States would gain its independence but be confined to the area east of the Appalachian Mountains. Britain would take the area north of the Ohio River. In the area south of that would be set up an independent Indian barrier state under Spanish control. However, the Americans realized that they could get a better deal directly from London. John Jay promptly told the British that he was willing to negotiate directly with them, cutting off France and Spain. The British Prime Minister Lord Shelburne agreed. He was in charge of the British negotiations (some of which took place in his study at Lansdowne House, now a bar in the Lansdowne Club) and he now saw a chance to split the United States away from France and make the new country a valuable economic partner. The western terms were that the United States would gain all of the area east of the Mississippi River, north of Florida, and south of Canada. The northern boundary would be almost the same as today. The United States would gain fishing rights off Canadian coasts and agreed to allow British merchants and Loyalists to try to recover their property. It was a highly favorable treaty for the United States, and deliberately so from the British point of view. Prime Minister Shelburne foresaw highly profitable two-way trade between Britain and the rapidly growing United States, as indeed came to pass. Great Britain also signed separate agreements with France and Spain, and (provisionally) with the Netherlands. In the treaty with Spain, the territories of East and West Florida were ceded to Spain (without a clear northern boundary, resulting in a territorial dispute resolved by the Treaty of Madrid in 1795). Spain also received the island of Menorca; the Bahama Islands, Grenada, and Montserrat, captured by the French and Spanish, were returned to Britain. The treaty with France was mostly about exchanges of captured territory (France's only net gains were the island of Tobago, and Senegal in Africa), but also reinforced earlier treaties, guaranteeing fishing rights off Newfoundland. Dutch possessions in the East Indies, captured in 1781, were returned by Britain to the Netherlands in exchange for trading privileges in the Dutch East Indies, by a treaty which was not finalized until 1784. The United States Congress of the Confederation ratified the Treaty of Paris on January 14, 1784. Copies were sent back to Europe for ratification by the other parties involved, the first reaching France in March 1784. British ratification occurred on April 9, 1784, and the ratified versions were exchanged in Paris on May 12, 1784. This treaty and the separate peace treaties between Great Britain and the nations that supported the American cause—France, Spain, and the Dutch Republic—are known collectively as the Peace of Paris. Only Article 1 of the treaty, which acknowledges the United States' existence as free sovereign and independent states, remains in force. The borders of the USA changed in later years, which is a major reason for specific articles of the treaty to be superseded. Preamble. Declares the treaty to be "in the Name of the Most Holy and Undivided Trinity" (followed by a reference to the Divine Providence) states the bona fides of the signatories, and declares the intention of both parties to "forget all past misunderstandings and differences" and "secure to both perpetual peace and harmony". Ratification of the treaty is to occur within six months from its signing. Eschatocol. "Done at Paris, this third day of September in the year of our Lord, one thousand seven hundred and eighty-three." Historians have often commented that the treaty was very generous to the United States in terms of greatly enlarged boundaries. Historians such as Alvord, Harlow, and Ritcheson have emphasized that British generosity was based on a statesmanlike vision of close economic ties between Britain and the United States. The concession of the vast trans-Appalachian region was designed to facilitate the growth of the American population and create lucrative markets for British merchants, without any military or administrative costs to Britain. The point was the United States would become a major trading partner. As the French foreign minister Vergennes later put it, "The English buy peace rather than make it". 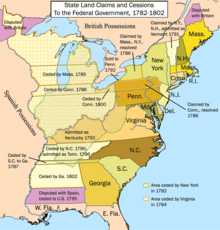 Vermont was included within the boundaries because the state of New York insisted that Vermont was a part of New York, although Vermont was then under a government that considered Vermont not to be a part of the United States. Privileges that the Americans had received from Britain automatically when they had colonial status (including protection from pirates in the Mediterranean Sea; see: the First Barbary War and the Second Barbary War) were withdrawn. Individual states ignored federal recommendations, under Article 5, to restore confiscated Loyalist property, and also ignored Article 6 (e.g., by confiscating Loyalist property for "unpaid debts"). Some, notably Virginia, also defied Article 4 and maintained laws against payment of debts to British creditors. The British often ignored the provision of Article 7 about removal of slaves. The actual geography of North America turned out not to match the details used in the treaty. The Treaty specified a southern boundary for the United States, but the separate Anglo-Spanish agreement did not specify a northern boundary for Florida, and the Spanish government assumed that the boundary was the same as in the 1763 agreement by which they had first given their territory in Florida to Britain. While that West Florida Controversy continued, Spain used its new control of Florida to block American access to the Mississippi, in defiance of Article 8. The treaty stated that the boundary of the United States extended from the "most northwesternmost point" of the Lake of the Woods (now partly in Minnesota, partly in Manitoba, and partly in Ontario) directly westward until it reached the Mississippi River. But in fact the Mississippi does not extend that far northward; the line going west from the Lake of the Woods never intersects the river. ^ The same day as the lopsided American loss at the Battle of Kedges Strait in Chesapeake Bay, one of the numerous ongoing engagements with the British and Loyalist forces throughout 1782 and 1783. ^ "British-American Diplomacy Treaty of Paris – Hunter Miller's Notes". The Avalon Project at Yale Law School. Retrieved October 19, 2014. ^ a b Paterson, Thomas; Clifford, J. Garry; Maddock, Shane J. (2009). American foreign relations: A history, to 1920. 1. Wadsworth Publishing. p. 20. ISBN 978-0547225647. ^ a b Black, Jeremy (1994). British foreign policy in an age of revolutions, 1783–1793. Cambridge University Press. pp. 11–20. ISBN 9780521466844. ^ a b "Treaties in Force A List of Treaties and Other International Agreements of the United States in Force on January 1, 2016" (PDF). United States Department of State. United States Government. p. 463. Retrieved 14 April 2017. ^ "Avalon Project – British-American Diplomacy: The Paris Peace Treaty of September 30, 1783,". ^ Dwight L. Smith, "A North American Neutral Indian Zone: Persistence of a British Idea." Northwest Ohio Quarterly 61#2-4 (1989): 46–63. ^ Charles R. Ritcheson, "The Earl of Shelbourne and Peace with America, 1782–1783: Vision and Reality." International History Review 5#3 (1983): 322–345. ^ In 1842 some shifts were made in Maine and Minnesota. William E. Lass (1980). Minnesota's Boundary with Canada: Its Evolution Since 1783. Minnesota Historical Society. pp. 63–70. ISBN 9780873511537. ^ Jonathan R. Dull (1987). A Diplomatic History of the American Revolution. Yale UP. pp. 144–151. ISBN 978-0300038866. ^ "A Century of Lawmaking for a New Nation: U.S. Congressional Documents and Debates, 1774–1875". memory.loc.gov. Retrieved September 11, 2015. ^ Ritcheson, Charles R. (1983). "The Earl of Shelbourne and Peace with America, 1782–1783: Vision and Reality". International History Review. 5 (3): 322–345. doi:10.1080/07075332.1983.9640318. ^ Bemis, Samuel Flagg (1935). The Diplomacy of the American Revolution. Appleton Century. ^ Ely Jr., James W. (2007). The Guardian of Every Other Right: A Constitutional History of Property Rights. Oxford University Press. p. 35. ISBN 9780199724529. ^ Jones, Howard (2002). Crucible of Power: A History of American Foreign Relations to 1913. Rowman & Littlefield. p. 23. ISBN 978-0-8420-2916-2. ^ Benn, Carl (1993). Historic Fort York, 1793–1993. Dundurn Press Ltd. p. 17. ISBN 978-0-920474-79-2. Dull, Jonathan R. (1987). "Chapters 17-20". A Diplomatic History of the American Revolution. Yale University Press. ISBN 978-0-300-03886-6. Hoffman, Ronald (1981). Albert, Peter J., ed. Diplomacy and Revolution: The Franco-American Alliance of 1778. University of Virginia Press. ISBN 978-0-8139-0864-9. Perkins, James Breck (1911). "Negotiations for Peace". France in the American Revolution. Houghton Mifflin. Stockley, Andrew (2001). Britain and France at the Birth of America: The European Powers and the Peace Negotiations of 1782–1783. University of Exeter Press. Archived from the original on July 19, 2008. Franklin, Benjamin (1906). The Writings of Benjamin Franklin. The Macmillan company. Wikimedia Commons has media related to Treaty of Paris, 1783. 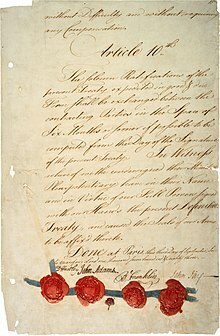 Treaty of Paris, 1783; International Treaties and Related Records, 1778–1974; General Records of the United States Government, Record Group 11; National Archives. Approval of the American victory in England Unique arch inscription commemorates "Liberty in N America Triumphant MDCCLXXXIII"
This page was last edited on 9 April 2019, at 16:05 (UTC).